trying to grab some happy: what up moose!!! while the article was quite entertaining, it was the commentary that got me!!! 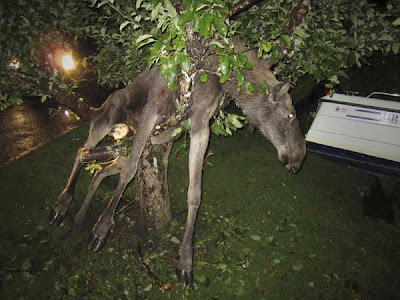 "moose is gonna get charged with tree u i." "Lay off the sauce, Bullwinkle. You can't fly like Rocky." I saw a glimpse of your post and had to finally come see this. Poor little guy! I guess my English isn't good enough to fully understand the phrases/titles... but I definitely can 'feel' the fun.